Goniometer stages can measure angles of objects such as crystals or move an object to a precise angular position along an arc, in relation to a fixed point in space. Two goniometer stages mounted in an alpha-beta configuration (stacked) can rotate an object around a fixed point in space on a spherical surface. 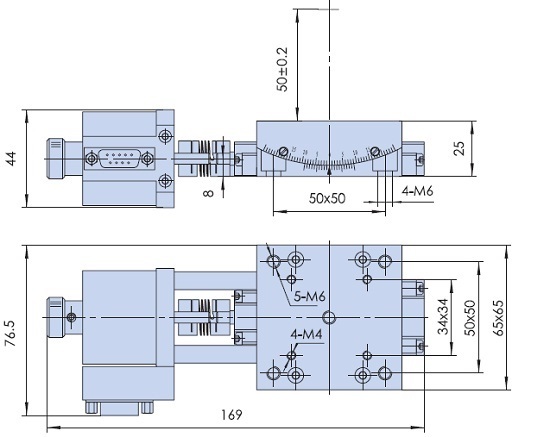 Optimal Engineering Systems (OES) offers stacked, precision aligned goniometer stages with a rotation center 50 mm above the upper stage. 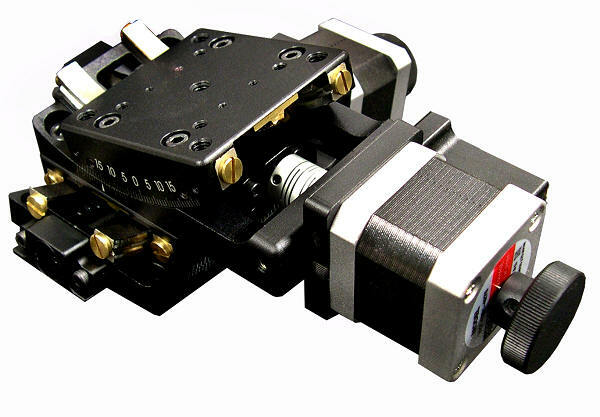 The lower (AK110-10) goniometer stage features a 65 mm x 65 mm table, ± 10O of rotation at a rate of 7O per sec. The upper (AK110-15) goniometer stage features a 65 mm x 65 mm table, ± 15O of rotation at a rate of 10O per sec. The accuracies for each unit are; repeatability: ± 4" (240 arcseconds), typical positional accuracy: ± 9" (540 arcseconds), and typical backlash is ± 3" (180 arcseconds). Goniometers and stacked goniometers are used for: Identifying crystals, examining cutting edges of medical instruments, estimating hyperspectral bidirectional reflectance, gloss measurements, measurements of radiation patterns of LEDs, Directing lasers, aligning mirrors, and manufacturing of quartz oscillator plates using quartz cutting x-rays.The precision, compact AK110-15-10 Goniometer stacked stage, available with either stepper, servo motors, optical encoders or manual adjustment knobs. It has a footprint of just 169 mm x 169 mm, and can be supplied plug-and-play with a motion controller. It is easily integrated into an inspection, testing, or manufacturing environment.